I took Darrell to Mills Creek earlier in the year on his first mining trip. His girlfriend Juli has now arrived in Anchorage, and we decided it would be fun for the three of us to run down to Crow Creek to look for her first gold. Temperatures are reaching freezing at night in Alaska now, and the water levels are dropping. We decided to use a sluice box to dig at water line, hopefully exposing gold-bearing material that is normally underwater in the summer. Snow started to fall as we approached Crow Creek, and a light dusting covered the ground when we reached the mine. Luckily we were prepared for the cold and it just added to the fun. We carried the gear to the creek and looked for a likely location. We all grabbed gold pans, and I showed Darrell and Juli how to sample for gold. 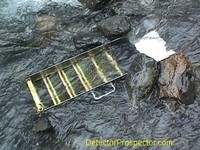 It always makes sense to do a little checking with gold pans before setting up a sluice box. We dug small holes behind larger rocks at the water's edge up and down the creek. For awhile it was just a flake or two per pan, but I finally got a decent showing against one bank. I set up the sluice while Darrell and Juli panned for gold. We were using Keene's A51 sluice, a very popular three foot model. The trick to setting up a sluice is to find some fast water. Most people set up a sluice with water running too slow. There seems to be a general fear of washing the gold away. I tend to set my sluice on the fast side. I may lose a few fines, but in areas where the gold has some size, it is more important to run a good volume of material. I try to set my sluice so that when a 14" pan of material with rocks less than 2" in size is dumped in everything just runs through. Like I said, I'm sure I lose some fines or flat flakes, but I feel I more than make up in volume with larger gold. If you have to toss every little pebble out by hand it slows you down too much. I always tell people to look at how a 2" dredge sluice runs... rocks 1.5" in diameter run through completely on their own. The A51 is about the same size as a 2" dredge sluice and should be run about the same way, unless you have nothing but fine gold. If that is the case, then the material should be screened and the sluice run slower to enhance fine gold recovery. I'm sure some would argue, but I simply find that if I shovel more yards through my box then the next guy, then I also usually get more gold. Here is another way to look at it. Let's say we are looking at 4 yards of material that runs an incredible 1/2 ounce per yard. You are determined not to lose any gold, so you first screen the material to 1/2" minus, then run it carefully through your sluice. By the end of the day, you manage to process one yard, and get an impossible 100% of the gold. You end up with 1/2 ounce. I work the same time you do, but I dump directly to my box, discarding only rocks larger than 2" in diameter. I run my box faster and deeper to move these larger rocks through. As a result I lose 25% of the gold since a lot of it is fine and flaky. But my increased volume allows me to process two full yards of material. I end up with 3/4 ounce of gold to your 1/2 ounce. To add insult to injury, we return the next day. There is one yard of this incredibly rich material left. We both go after it; you manage to process another 1/3 yard while I move the remaining 2/3 yard. Your final weekend total is .83 ounce of gold, while my weekend of work nets me 1.25 ounce of gold. The bottom line - from any theoretical 100% recovery position, if you double your volume of material the recovery percentage would have to drop to 50% or less to end up with less gold. My observation is that most recreational miners are under-utilizing their equipment for fear of losing gold, or just plain not working hard enough. So my advice is "you want more gold, move more dirt"! The only time this is likely to be a losing proposition is if the gold is exceptionally fine and/or flaky. It is also for miners with limited time. If you have lots of time, and limited reserves of material, (or are commercial!) then increased attention to recovery rates makes more sense. Darrell and I fed the sluice while Juli worked on her panning. We kept seeing smaller gold showing up in the sluice, but nothing too large. Then Juli came up with her first nugget. It was larger than anything we had found in the sluice so far, about the size of a watermelon seed. Not too bad for her first nugget! In fact, it turned out to be the largest nugget of the day. The site we were at did not seem to be paying out all that well, just lots of fines, so we went back to prospecting with pans. I located a spot behind a large boulder about 100 feet downstream that produced a dozen pieces of gold in a pan, so we moved on down. The gold was in a layer just at waterline, and seemed fairly rich. Again, however, the gold was pretty small stuff, with no real nuggets. We worked another couple of hours, and then called it quits as our backs began to get stiff. It is much harder to run a small sluice than a 6" dredge in my opinion! We panned out the sluice and were rewarded with between two and three pennyweight of medium and fine sized gold. Juli thoroughly enjoyed her first gold mining trip, and fun was had by all.